Once upon a time, dinosaurs walked the Earth. Some survived by taking out the competition while other lived off nature itself, eating plants. But this particular tale isn’t about climbing the food chain. 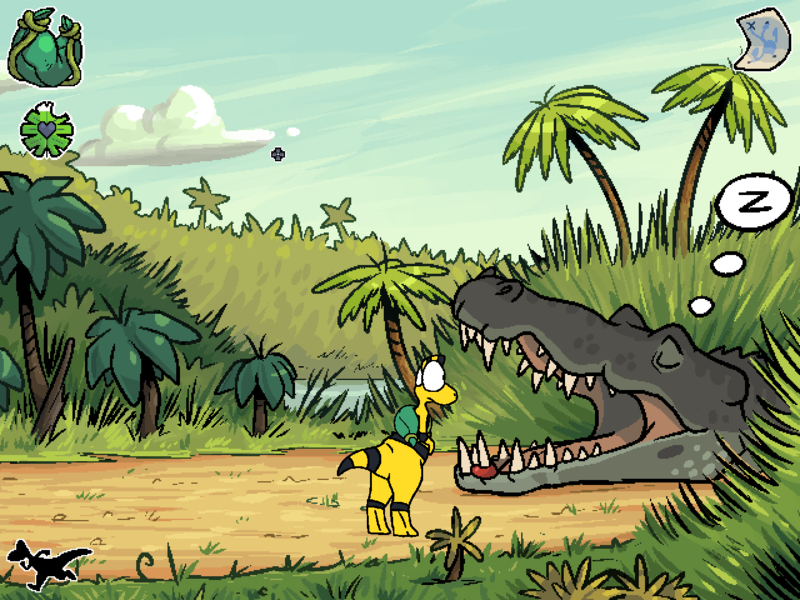 Or at least, not specifically, as the focus in Zid & Zniw Chronicles: Zniw Adventure is on helping Zniw, a rather unfortunate young dinosaur, get back home. Time to point ‘n click like it’s 200,000,000 BC… again! Oh, did I mention how she is not only wearing a backpack full of useful items, but also, somehow, is capable of reading a map? So much for dinosaurs not being the brightest lot, eh? And yet, as has already been made note of, she won’t be able to find her way home without help. This is where you, the player, comes into, well, play, on a journey that’ll take the two of you from jungle to forest, through mucky swamps and barely lit caves – a grand adventure, as it were. An adventure which, surprisingly enough, is – according to the developer – is entirely void of blood and violence, although I suspect there’ll still be hazardous situations of some nature. I mean, prehistoric times weren’t exactly the most peaceful, dinosaurs and all, ya know? Also, when you’re not busy trying to figure out how to progress, there’s likely something new in the in-game encyclopedia about locales visited and characters encountered. Just saying. As for availability, Zid & Zniw Chronicles: Zniw Adventure is scheduled for release “either in mid or mid-late 2016” for Windows, Linux and OS X being considered. Until then, why not take the demo for a spin, get a taste of things to come?